New Rhino Linings® hybrid spray foam product, ThermalGuard™ OC1.6, is a cost effective 2-pound spray foam alternative. Rhino Linings Corporation (http://www.rhinolinings.com), a leading supplier and manufacturer of protective coatings and spray foam, today announced the release of ThermalGuard OC1.6. ThermalGuard OC1.6 is a unique water-blown, high-yield, hybrid cell spray polyurethane foam product that can be recirculated in cold temperatures, making it a robust, user-friendly alternative to traditional closed cell products in a wide variety of adverse conditions. "Our new hybrid product, ThermalGuard OC1.6, boasts the semi-rigid appearance and compressive strength of a standard 245fa-blown 2-pound closed cell spray foam without the closed-cell product challenges like off-gassing in the drum or the inability to recirculate and pre-heat material when conditions warrant," says Pierre Gagnon, president and CEO. "Spray foam contractors can now experience the best benefits of open-cell and closed-cell technology in one product that combines the higher yields and cost-effectiveness of an open cell foam with the sprayability, aesthetic appearance and strength of a closed cell product. It's the best of both worlds and we believe it's an ideal solution for many contractors seeking a competitive advantage." The hybrid cell chemistry of ThermalGuard OC1.6 contributes to its impressive yield. When applied, ThermalGuard OC1.6 expands to 25 times its size in approximately 12 seconds and can be safely applied in lift thickness of up to 2 inches. ThermalGuard OC1.6 is a high-performance building envelope insulation system designed for use in residential and commercial structures, and is often used to provide exterior foundation, perimeter, tank or pipe insulation. 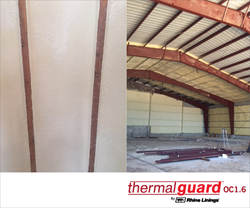 The addition of ThermalGuard™ OC1.6 to the Rhino Linings spray polyurethane foam product offering both supports spray foam contractors looking to achieve greater profit in the field and provides a greater variety and versatility to the company’s growing line of high-performance building products. To learn more about ThermalGuard OC1.6 and Rhino Linings Corporation’s line of spray foam products, visit http://spf.rhinolinings.com. Rhino Linings Corporation, established in 1988 and headquartered in San Diego, California, is a privately-held corporation and world leader in protective coatings and linings. Products manufactured and distributed by Rhino Linings Corporation include polyurethane, polyaspartic and epoxy coatings, concrete coatings, spray foam insulation and sealants, and interior and exterior stucco. Rhino Linings Corporation has a global retail and industrial applicator network consisting of more than 2,000 independently owned and operated businesses in almost 80 countries. For more information about Rhino Linings Corporation, call 858-450-0441 or visit http://www.rhinolinings.com.